... with my little eye, Something Beginning with C! Brace yourselves, it's gonna be a biggy! Morning Fluffettes! That's the theme over at Cupcake this week. (Something Beginning with C, not Fluffettes!) Quite simple really, we want to see your creations incorporating Something Beginning with C (Christmas, colours, shapes, choklit, cars, cake etc). We're sponsored this week by Simon Says Stamp and our Icing on the Cupcake sponsor for May is Crafts U Love. 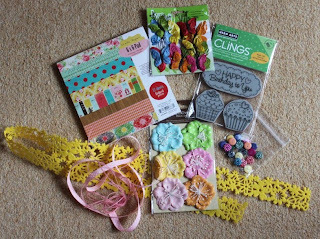 So, if you want to know how to get your mitts on it, head over to Cupcake to find out how. You can get a peeky at The Cupcakes' gorgeous creations while you're there too. Oooooh, before I forget, if you use this code: CUPCAKEBH at Checkout at Funky Farm Scrapbook Barn, anytime up to Midnight on 9 May, you'll get a whopping 10% discount on your basket! Thanks for joining us for the Hello Cupcake Blog Hop. If you've just arrived from Donna then you're in the right place! While you're here, please leave a comment and then hop over to Liza. Don't forget to leave a comment on each Blog in the Hop, including Cupcake and our Guest Designer, Hayley's , before adding your name to Mr Linky there, for a chance to win the Candy from Funky Farm Scrapbook Barn. Wonderful card! I love the layout and the image. Those buttons are a perfect touch! Hugs! Oh Fluff.. I love Ronnie... I love love the papers and I love love love your card!! What a beautiful card, Fluffie...I also have these papers and they are so great....my compliments for your colouring of Ronnie! Faye Thank you sooooo much for allowing me to be part of your magnifilicious blog hop! What an exciting day for you all!!! I love your card, those papers are some of my recent favourites and I love everyone's creations! Best of luck for the new look cupcake challenge blog. I love my DT badge and am displaying it with pride! What a nice boy-card! I really love the simplicity of it! This hop is very inspiring! This is great Faye! Love the sketch and papers! Cute image too! Perfect for a guy card! This is just SUPER FANTASTIC!!! Love everything about it. 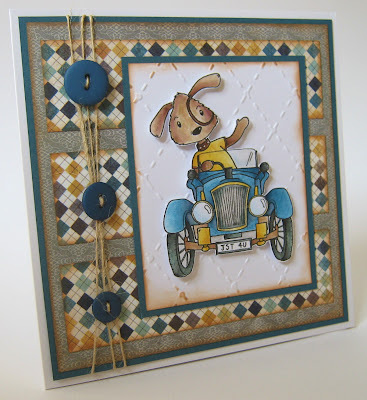 Hi Faye super card and so love the cute image, great idea with buttons too. my goodness you have had such a busy day!! Fab card and fab papers...I am loving them at the minute!! Funky colours! Love the card! Cute card. Love that little dog in the car. What a great card....super image and your coloring is fabulous!! You've been busy making cards! I've been busy with a baby! How do you get anything done with a little boy in the house? love the card. what a cute image, that old card is fab. thanks for sharing. A gorgeous card and image Fluff, great colouring. I love this cute image mixed with the vintage look! Just a funny card!!! Cute image and great colouring! That is such a cute image!!!! Love the colors in that card too.